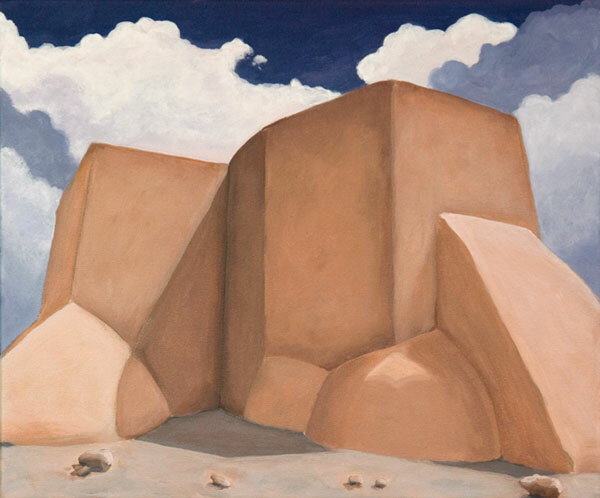 Georgia O’Keeffe did two paintings that I know of from the back of the St. Francis De Asis Church. Inspired by her clean lines, sensuous forms and soft colour palette, I thought I’d try that more modernist approach by flattening the sky. I shot my reference photo at a slightly different angle to O’Keeffe’s compositions and decided to crop the painting so that the forms ran off the canvas.